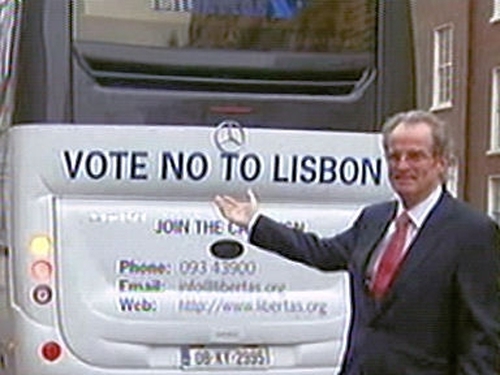 Businessman Ulick McEvaddy has added his voice to the Libertas campaign for a No vote to the Lisbon Treaty. Speaking in Dublin this afternoon he said that he had read the Lisbon treaty four times and he did not understand it. He said that by contrast he had read the US constitution and he understood it readily. He said he read Bunreacht na hÉireann at school and he understood that. He said we are simply being asked to vote for something here in Europe that nobody understands and that is being handed out as the Lisbon Treaty. He said he agonised long and hard before he went on the same side of the fence as Sinn Féin to 'Vote No'. He said it was not in his style and he has never been on that side of the fence before. But he said he made up his mind based on what he believes is right for the people of Europe. However Minister for Education Mary Hanafin said that Irish people see how the country has benefited in terms of social funding and infrastructure from being part of the EU. ‘We're a very globalised world, and we're a very small country. We continue to gain through Europe and the Lisbon Treaty helps us to do that,’ she said on RTÉ's The Week in Politics.